Central Texas WSC’s new Doc L. Curb state-of-the-art, energy efficient 4 million gallon per day PALL Microfiltration Plant was commissioned into service in December, 2011 at a construction cost of $8,157,597.85. Strategic planning by the Central Texas WSC Staff and Board of Directors and S. D. Kallman resulted in providing treated surface water from Lake Stillhouse Hollow to the wholesale provider’s existing customers in the eastern half of its vast seven county service area as the Texas drought of 2011 took hold. As receding water levels in Lake Stillhouse Hollow rendered many raw water intake pumps useless in the upper (western) part of the Lake, this new plant designed by S. D. Kallman, L.P. receives its raw water from the new 8 MGD raw water pumping facility located in the deepest part of the Lake, near the dam. Pristine quality lake water is available at this location, which makes the job of treating the water extremely cost efficient. Central Texas WSC’s new treatment plant has experienced 30% of the electrical costs of its older plant on the upper part of the Lake, due to the raw water quality and green elements designed into the plant and high service pump station. Premium efficiency pumps and motors are operated by variable frequency drive motor controllers. Plant energy requirements are met partly by solar power cells. Plant heating and cooling requirements are provided by a geothermal heat transfer system consisting of ninety (90) geothermal wells drilled in a nearby field. Three rainwater harvesting pump stations were provided to irrigate the Plant’s landscaping. Water from the Plant’s backwash storage pond provides a backup supply of irrigation water to each pump station’s wet well during dry periods. Potable water leaves the 8 MGD high service pump station, located on the plant site and flows through 9 miles of 30” and 24” ductile iron water lines terminating in a new 600,000 gallon, 130 foot high composite elevated tank located east of Salado. It is from this point that Central Texas WSC’s eastern customers are served through existing water distribution lines. 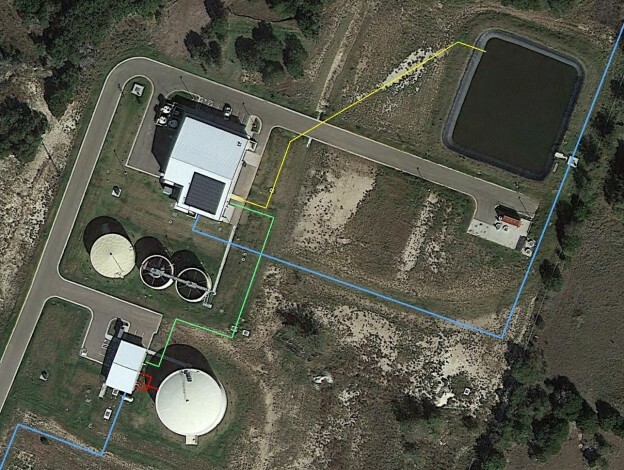 In order to obtain approval by TCEQ to waive the membrane equipment pilot test requirement, S. D. Kallman prepared a report for an alternate site exception, which allowed the water treatment plant to be deemed “shovel ready”, which qualified this project for a $22,340,000. Texas Water Development Board American Recovery and Reinvestment Act loan at 0% interest.